Here’s the deal: the idea of the game is you have a member of the group that’s the Producer. The Producer has $20,000,000 to drop on movie pitches he really enjoys. You, and the rest of the people playing (between four to ten players, more if you have more than one copy of the game), are attempting to pitch a great movie to the producer as the Screenwriters. In order to do so, you have four types of cards to play, that you randomly draw so you have three of each type in your hand. 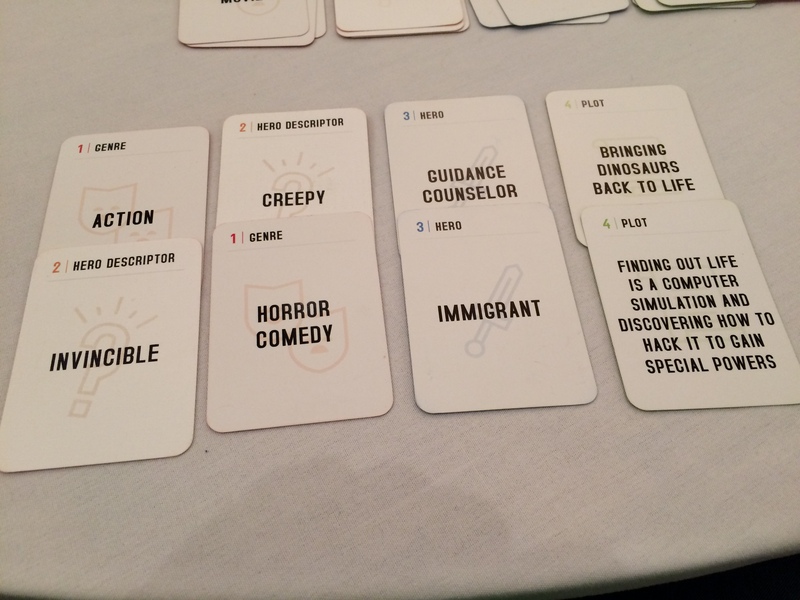 Those cards are: Genre, Hero Descriptor, Hero, and Plot. You can either let those cards speak for themselves, or you can flesh out the idea however you choose, to try to get your film sold to the Producer. 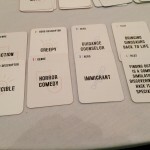 The game plays a lot like other card games of this type, like Apples to Apples or Superfight, but it is unique in that you can flesh out your idea, which leads to a lot of really cool pitches, as well as your opponents pitching in, asking who you would be casting or joking about how insane your film seems. After everybody goes, the Producer then pays out his $20 mil any way they see fit. They can pay all of it on a single film, or break it down in $10 and $5 mil portions. When the cards run out, then everybody sees how much money they raised, and the person with the most money is the winner! With 400 unique cards, and 100 million combinations for your films, it is hard to believe this game will get boring any time soon! It’s a great group game, especially if you’re with a bunch of creative people who love to tell stories. In addition to the play cards, it also comes with the play money for the Producer to pass out, and it all is packed neatly into a blue box that, although with all the fun it has packed in feels like it’s bigger on the inside, isn’t THAT blue box. Plus, if the stretch goals are met on Kickstarter, there is also going to be an 80’s Action Pack, which introduces 30 new cards, and if the final stretch goal is met, there’s an engraved D6 that compliments some of the optional bonus rounds nicely! Now here’s the kicker, my friends! This great game, which Geek really would love to have on his game shelf to play with family and friends, needs $15,000 to be made. However, they are currently (as of 9:03 PM Eastern, on 12/2/2015) sitting at $10,037. This Kickstarter ends in a week, at 5:00 PM on Friday, December 11th. This means that, if we want to have nice things, we need to raise $5K more in the next week. If we want to have really nice things, then we need to raise $10K in the next week, and if we have to have fantastic things, we need to raise $15K in the next week! So, how can you help make this locally-produced, fantastic game get into everyone’s hands? First, head over to their Kickstarter Page. Then, look over their supporter levels. For a paltry $25, you can get the game itself, and any of the stretch goals that they (hopefully) hit. Going up from there will get you buttons, stickers, postcards, sunglasses, or even multiple copies for your game shop’s inventory! Also, if you’re not sure, you can also read their page, watch their demo video, and even download a print and play demo version of the game, with 270 of the 400 cards they’ve developed for the game! They also have listed future plans for the game, if they can just get it off the ground! Now get on over there, and check it out! Thanks so much for the kind words and support Tony! I want nice things! I printed out the pdf files for Thanksgiving and had a blast playing with a 10 yr old, two relatives in their early 20s, husband and myself (let’s just say quite old enough to have a 10 yr old). 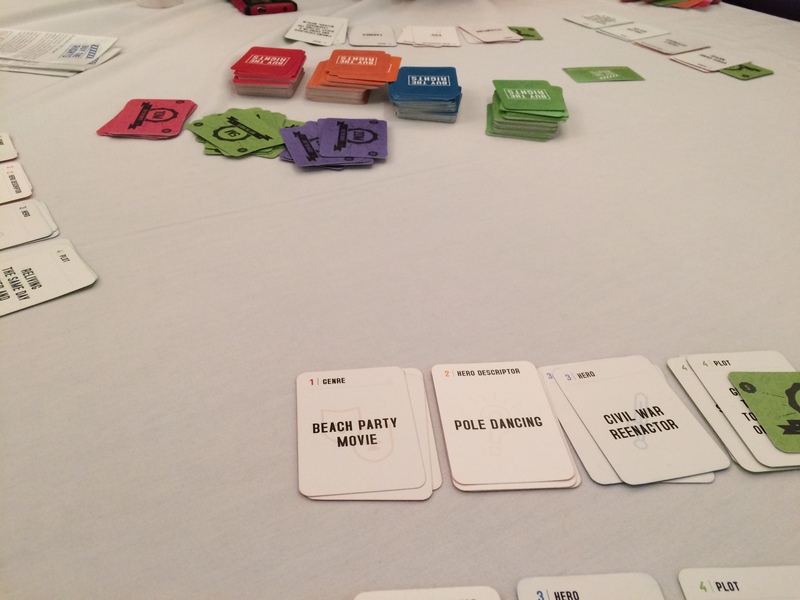 We played it for hours, and everyone loved trying to make their best pitch! 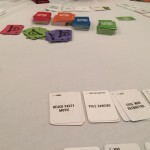 Toward the end, there was a lot of strategizing, holding certain cards for certain people. (The person who saved “The Bass Player” Hero card for my hubs won all 20 Million that round!) Thanks for your efforts to get the game across the finish line!